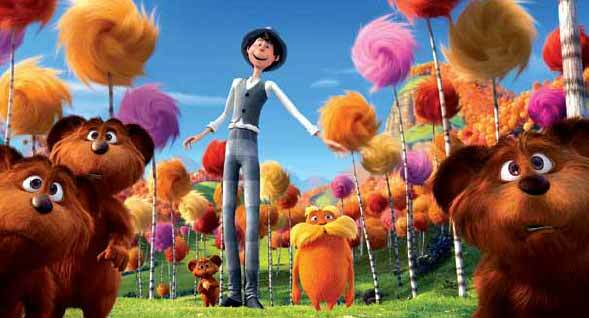 Dr. Seuss’ The Lorax came out on Blu-ray this week from Universal Home Ent. The hit from Chris Meledandri looks gorgeous, showing off the outstanding work from Illumination Mac Guff in France. In addition to a deleted scene (see below), there’s also the mini-movies: Wagon-Ho!, Forces of Nature, and Serenade. But the ecological cautionary tale from Dr. Seuss provided all sorts of story and animation challenges. Director Chris Renaud says, “One of the funny things that we discovered was that because they don’t look like trees or animals that we understand or relate to directly, you have to create, based on Seuss’ illustrations, something that’s believable. Because the Truffula trees are beautiful — they look like cotton candy. 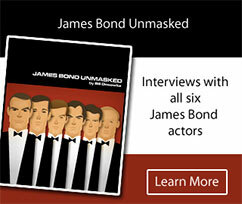 But, by the same token, you have to create something that the audience feels something for. So it can’t just feel like Candyland; you have to buy it as a real forest. So we looked at Birch trees and then figured out how to make those wonderful illustrations work in a 3-D movie. It’s a real fantasy forest that you could relate to when it’s being chopped down. “We had a design that was very city-like and very dense, which wasn’t quite working. But we went back and looked at a little drawing in the upper corner of the page when the little boy is first coming to look at the Lorax. And we sort of used that as our basis: it’s got these big, curvy roads and a couple of building shapes. In some ways, the easier choice would’ve been to create a Blade Runner-like dystopian future with smog. But of course we wanted to create something that was fun and entertaining, but in some way relates a little more about where we are today, with inflatable bushes and plastic flowers and fake nature that still has a sense of fun, much like Disneyland or Las Vegas or Dubai.